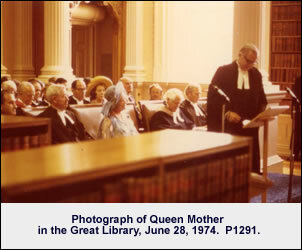 In an event that caused great excitement among Benchers, Judges, and staff, Her Majesty Queen Elizabeth, The Queen Mother, was called to the Bar of Ontario and named an Honourary Bencher of The Law Society of Upper Canada on June 28th, 1974. A Royal Visit requires much planning, and this visit was no exception. In addition to careful scheduling and security arrangements, the caretaking staff had to reassemble the main reading room of the Great Library for the occasion. Tables had to be moved, chairs and carpet runners rented, a platform erected, and catering service ordered for the outdoor reception, with a backup plan to move the reception to Convocation Hall in case of rain. Task list for Royal Visit signed by John Glen, Osgoode Hall's superintendent from 1952 to 1977. The list of tasks that the caretaking staff had to attend to included shining all of the brassware in the areas through which the Royal guest would walk, replacing the scorched lamp shades on the wall brackets on the Benchers staircase, ensuring that the washrooms were adequately supplied, and removing the notices from the library board in the corridor. Also on the list: "Our staff should be asked to be dressed tidily." 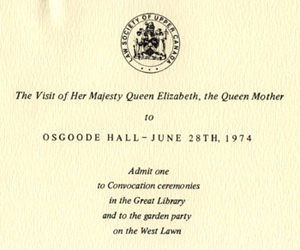 On June 28th, a civic reception was given in honour of the Royal guest at Nathan Phillips Square at 11 a.m. After that, Her Majesty was driven in a powered cart across Nathan Phillips Square to the Benchers' Entrance of Osgoode Hall, where Treasurer Stuart Thom and Chief Justice Gale received her. After the formalities of presenting several distinguished guests to Her Majesty, the Royal party proceeded to the east end of the Great Library for the Special Convocation. Province." The Treasurer then conferred the degree of Barrister-at-Law upon Her Majesty and called her to the Bar of Ontario. Former Treasurer William Howland then proposed a resolution that she be elected and enrolled as an Honourary Bencher. The formal ceremony concluded with remarks from Treasurer Stuart Thom on the history of Osgoode Hall and the Law Society, concluding that "Your Majesty's visit here today and membership in this Bench renews a cherished link between the Royal Family and the legal profession of Ontario." Her Majesty then took the oath and signed the roll. Finally, the Royal guest addressed Convocation, in a brief but moving speech in which she said that she was "proud to become a Bencher of this Law Society, which is the oldest in Canada." She went on to praise the system of Common Law, noting its enduring quality, capacity to adapt to social change, and its over-riding respect for the rights of the individual. Expressing an appreciation for Ontario's legal system, she continued: "I know that in Ontario there exists a respect and love of justice. Under the protection of your Courts, people from all over the world have been able to choose their various ways of being good citizens, respecting others, but not forsaking their own inheritance. Your Judiciary and the members of the legal profession, have been true to the highest traditions of the British Bench and Bar, and I know how much this is due to the influence of Societies such as yours." The weather that day was gloriously sunny. After the Royal guest had left for Campbell House, "the Treasurer and the Benchers and their wives entertained the Judges and their wives and representatives of the Advocates' Society and their wives at a garden party and buffet luncheon on the west lawn of Osgoode Hall." Despite Brendan O'Brien's comments on women in the profession, apparently the only woman who counted on that day was the Royal guest herself.